Italians have restored the Byzantine rock-cut Tokali Church, one of the wonders of the Cappadocia's Goreme Valley, to its former splendor. 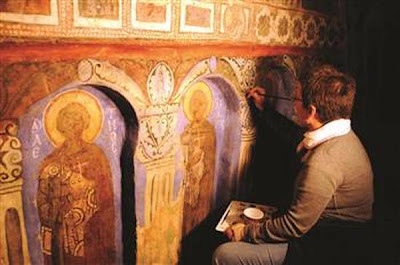 A team from Tuscia (Viterbo) University's Department of Restoration and Conservation led by Prof. Maria Andalora has just finished restoring the millenarian frescoes in Tokali and in the nearby Sehitler Church in the town of Goreme, pop. 2000, known in antiquity as Korama, and which has been declared a UNESCO World Heritage site since 1985. The results are breathtaking, according to Hurriyet newspaper, especially in the Tokali (Buckle) Church, which Andalora has dubbed 'the Cappadocian Sistine Chapel', and where the frescoes covering the walls entirely have recovered their original luminosity, the effigies of saints and delicate decorations shining with gold, blue, and red in what is yet another calling card for Italian experts in Turkey. Itay's ambassador to Ankara, Gianpaolo Scarante, recently said that a vast new multi-billion-euro art restoration market is opening in Turkey, where a boom is in full swing and the authorities are planning heavy investments in restoring the country's artistic and architectural wealth. ''Turkey could be a mine of work for a restoration superpower like Italy,'' Scarante has said, adding that in Istanbul alone the jobs and investments are enormous. 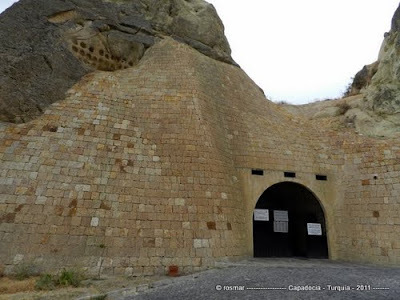 The two Goreme churches restored by Italian experts were built to commemorate 40 Christian soldiers who died on the battlefield in Sivas, in central Anatolia, according to Nesvehir museum authorities. The restoration was financed by Italy, and will include periodic conservation interventions over the next two years, Andalora explained. Tokali, she said, ''is one of the most important churches not only in Cappadocia, but in the entire Mediterranean basin.'' Also on her team were Livia Alberti, who worked on the Santa Sofia restoration in Istanbul, Silvia Borghini, Cristina Caldi, Sara Scioscia, and Valeria Valentini, as well as both Italian and Turkish experts in frescoes, sculpture, mosaics, stone, and painting on canvas and on wood. The 'open-air museum' of the Goreme rock-cut churches is one of the jewels of Cappadocia, melding with beautiful landscapes such as the nearby Peribacalar Vadisi, or Fairies' Paths, with their pyramid-like rock formations, and Byzantine masterpiece rock paintings. A wave of Christians migrated to Goreme in the 8th century. For more than three centuries the valley, with its 400 rock-cut churches, was one of the most important religious centers in Anatolia. Now, after centuries of isolation, Goreme again welcomes influxes of migrants, especially in the summer. This time they are tourists.